Itâ€™s a classic confrontation: the little guy versus the big corporation. In this case, the little guy is 6-foot Nebraskan farmer and rancher Randy Thompson, and the big corporation is Canada oil giant TransCanada. And on the giant TransCanadaâ€™s side: officials in the Nebraska statehouse and legislature who are choosing to advocate for the company, not for protecting the stateâ€™s ranch- and farmlands. What TransCanada wants is to run the Keystone XL oil pipeline from Alberta down through the Plains Statesâ€”including Nebraskaâ€”to refineries in Texas, to be sold to the highest world bidders. Never mind that another TransCanada pipeline has had 12 confirmed leaks in less than a year, one of which spewed 20,000 gallons of tar into the air. The pipeline will bring construction jobs to Nebraska, says the governor, and thatâ€™s whatâ€™s important. Thatâ€™s when the threatening letters began, as well as the phone calls, and they continued for seven years: If Thompson didnâ€™t give TransCanada what it wantedâ€”and it eventually offered to pay him serious cash for the route through his landâ€”they would seize the land under eminent domain. It didnâ€™t matter that TransCanada is a private, Canadian corporation, not a US or Nebraska governmental agency. Thompson wrote to Nebraska Governor Dave Heineman about his concerns and in return got a form letter thanking him for his input. 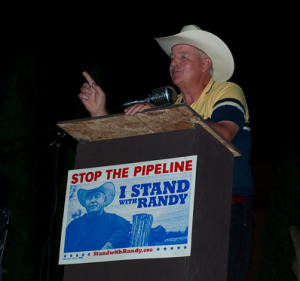 Randy Thompson decided it was more important to fight TransCanada than to continue his full-time ranching and farming. He stepped away often enough to become the face and the voice of the anti-pipeline movement in Nebraska, testifying before the state legislature, before the U.S. Congress, and before the State Department. With the help of the nonprofit organization, Bold Nebraska, he began appearing on local and national media. And he is the actual face on t-shirts that feature the slogan, â€œI stand with Randy.â€ TransCanada changed its proposed route to one that skirts Thompsonâ€™s land, but Thompson didnâ€™t stop speaking out; a lot of other peopleâ€™s land was still endangered. Finally, in 2014, a possibly temporary victory: Despite the TransCanada/State of Nebraska partnership, a district judge declared unconstitutional the law that gave the governor and state environmental regulators the authority to approve oil pipeline routes. At this writing, the Nebraska Attorney General is appealing the ruling. You can track his work at www.boldnebraska.org.